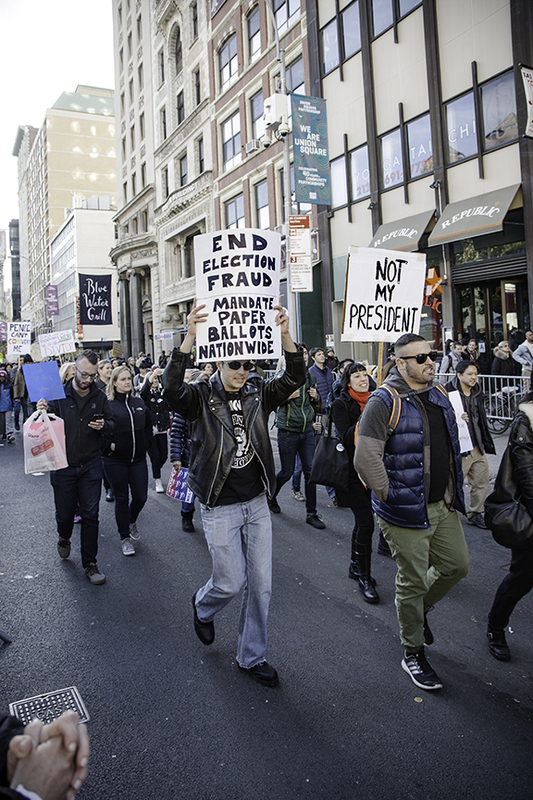 Four days after the American Presidential Election of 2016, thousands of people gathered in New York City’s Union Square to protest Donald Trump, the president-elect. 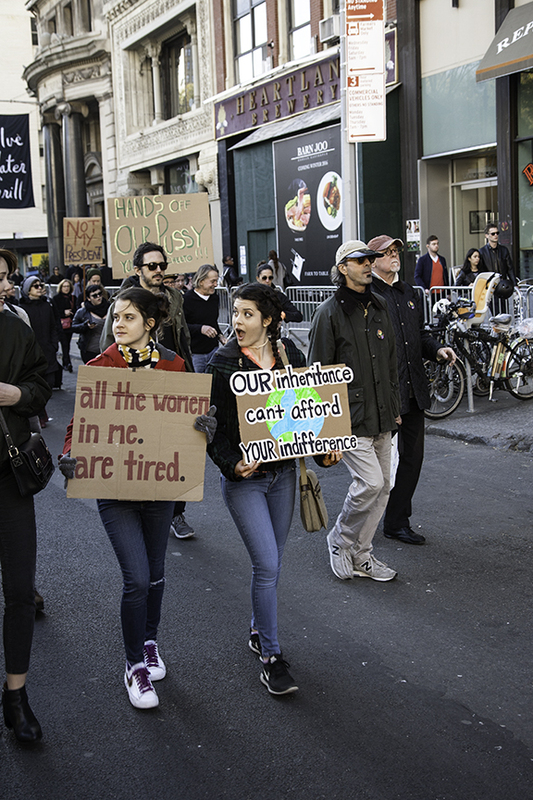 This was the fourth day of demonstrations around the country. 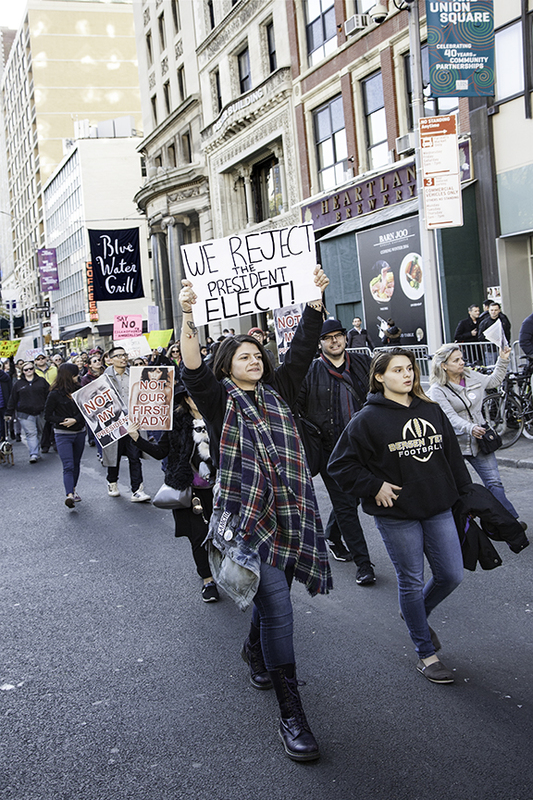 After first massing at Union Square for several hours, the New York crowd then marched north to Trump Tower. 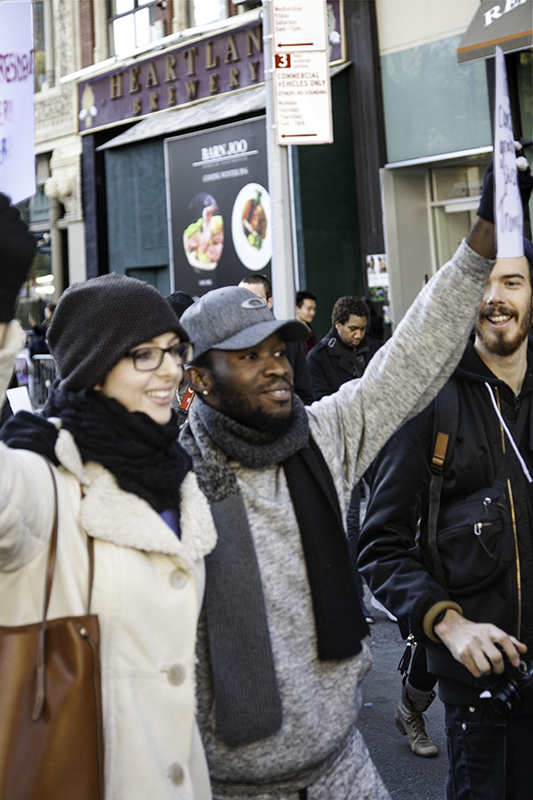 The demonstration was organized by BlackMatters, a nonprofit news outlet. Bernie Sanders ended his presidential run for the Democratic candidacy in the second week of July, 2016, when he endorsed Hillary Clinton. 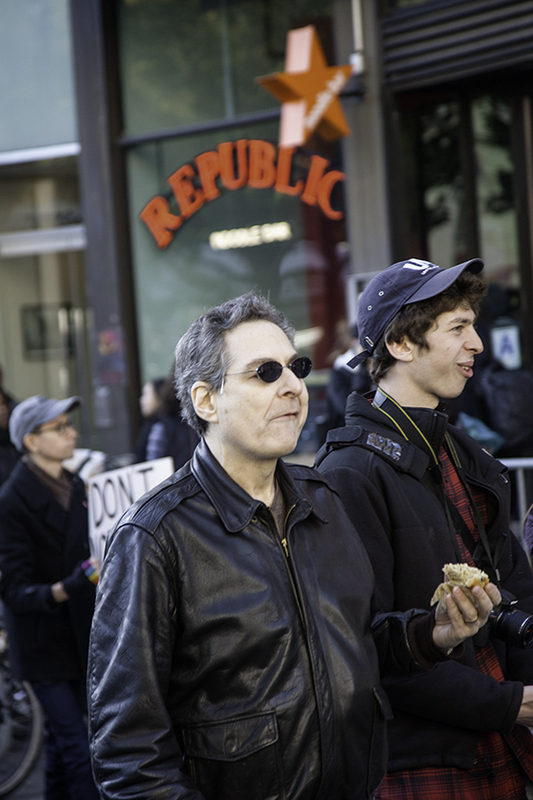 So why do I begin this post with a shot of someone wearing an old “movement4bernie” button? 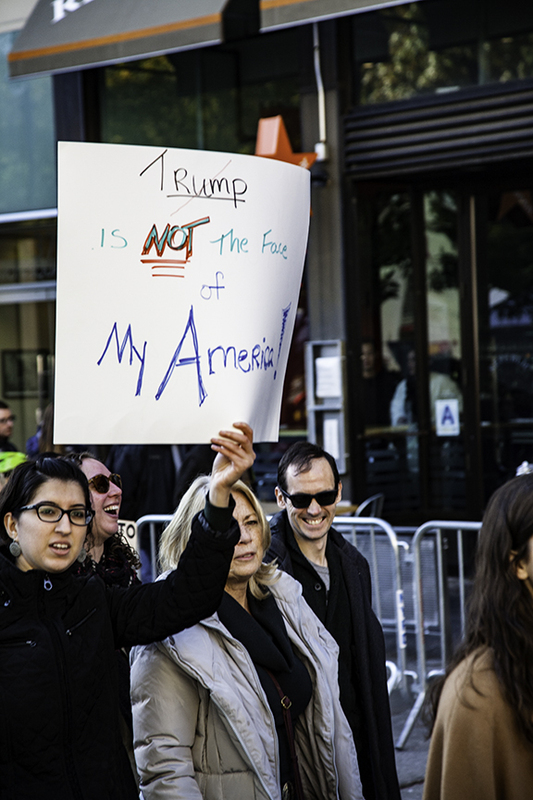 First, because I saw this in the crowd at Union Square, instinctively shot it, and liked the photo; liking a photo is essential to each image that I select for my blog posts. Second, because two weeks ago (mid-March, 2017), a FoxNews poll listed Bernie Sanders “the most popular politician in America.” Bernie’s favorability rating was was 61%, putting him fourteen points above that of Vice-President Mike Pence and eighteen points above that of President Donald Trump. 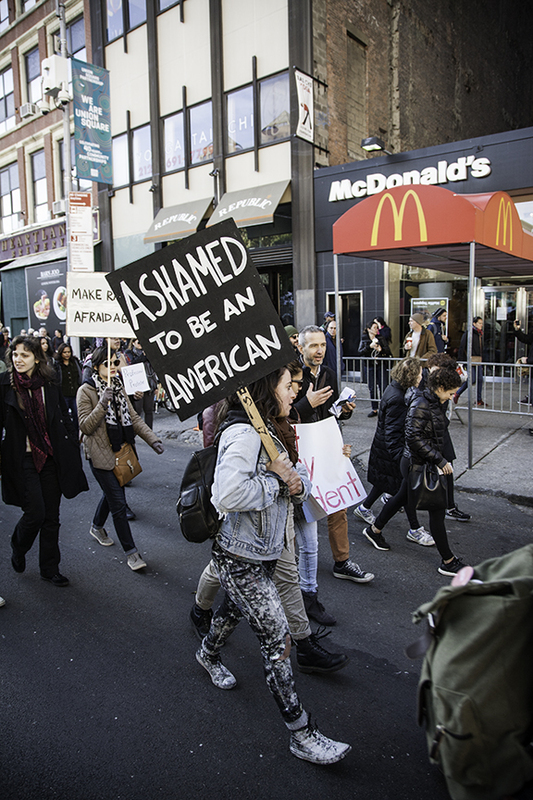 Many Americans feel ashamed because Donald Trump, the man who had just won the election (and now is president), seems the personification of the Ugly American. This term was first used in reference to arrogant, demeaning and ethnocentric behavior of Americans traveling abroad. Then, in 1958, it became the title of a political novel, one result of which was President Kennedy’s establishment of the Peace Corps as an attempt to counter the embarrassing failures of our diplomatic corps. He has offended (and I apologize if I’ve left some group out): African-Americans, Native Americans, Mexicans, Jews, Muslims, war heroes—war heroes!—families of war heroes, the disabled, women, and babies. Babies! Through word or action, Trump has promoted gun violence, bigotry, ignorance, intolerance, lying, and just about everything else that can be wrong with a society. A month ago, a Marist Poll found that its respondents described President Trump’s conduct “embarrassing” by a margin of 58% to 33%. Even Bruce Springsteen, in a concert in Australia last month, said that he “was embarrassed to be an American” because of the Trump presidency. 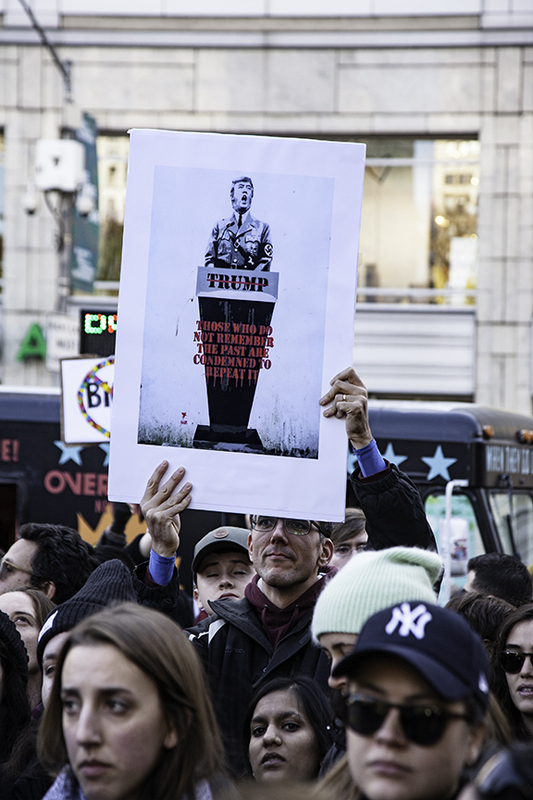 This poster shows an image of Donald Trump behind a lectern dressed as a Nazi SS Officer. Underneath the lectern, in red letters, are the famous, cautionary words of the philosopher and author, George Santayana: Those who do not remember the past are condemned to repeat it. Trump, of course, is not a Nazi. Moreover, those who make Nazi analogies or invoke Hitler risk undermining whatever is their intended argument and risk appearing ignorant (at least of history). See the cautionary remarks, for example, in Kurt Eichenwald’s Vanity Fair essay of 2014. On the other hand, even if, last November, this sign might have been condemned as historically inappropriate, it may be justified by events of late. As suggested by Piers Brandon, or Knute Berger, or Marcus Johnson, the White House’s adherence to “alternative facts” parallels the propaganda campaigns of Nazi Germany. Also, it has recently been shown that Trump’s top counterterrorism adviser, Sebastian Gorka, had sworn a lifetime oath to the right-wing Hungarian group with Nazi ties, Vitézi Rend. When I saw this sign, I was unaware of the reference to Idiocracy, besides it being clever, new word. 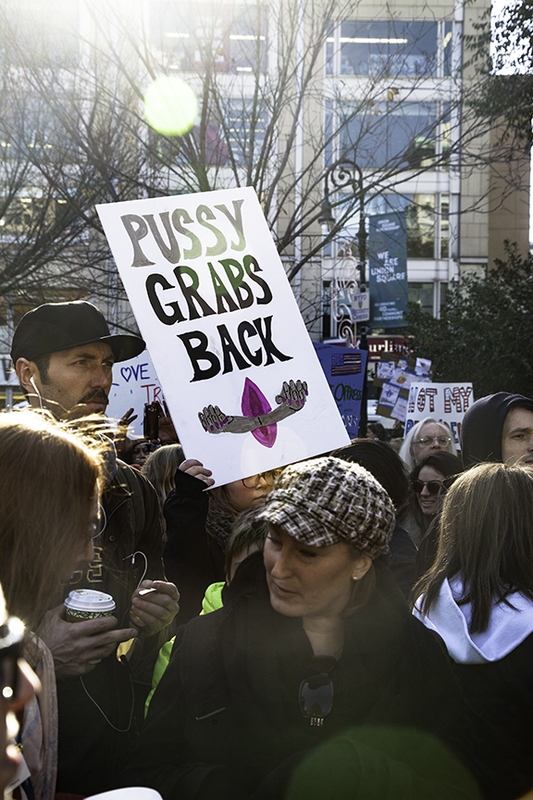 Now enlightened, however, I see the connection this sign is making to Donald Trump. Idiocracy is a 2006 satirical film about a futuristic dystopia in which advertising and anti-intellectualism reign to the detriment of intellectual curiosity, social responsibility and human rights. Nothing could be more prescient than this to America today under Trump! As to social responsibility and human rights, the Trump White House appears to ignore and trample on them with every move. 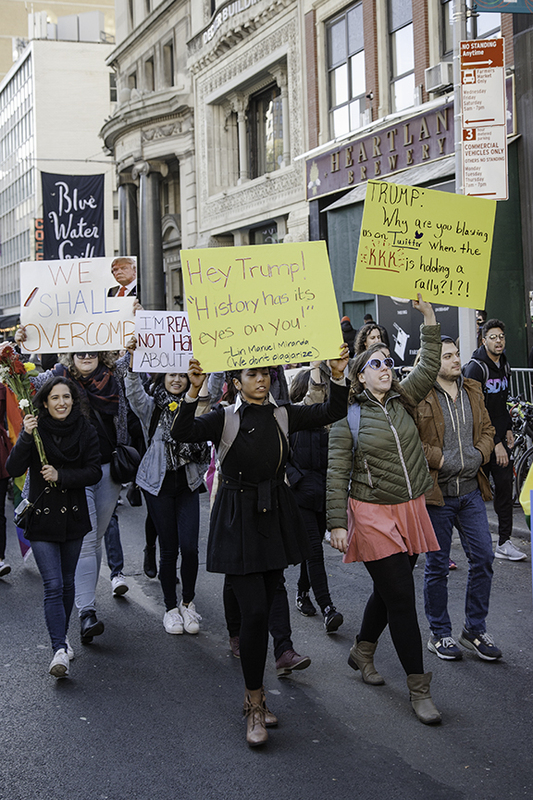 Another HuffPost article, for example, offers ways to fight for social justice under Trump, while Human Rights Watch provides links to all the ways in which Donald Trump is undermining human rights. Idiocracy may, indeed, be as worthy a descriptor of the Trump presidency as any other. This statement by Abraham Lincoln is humorous and self-effacing, qualities that Donald Trump completely lacks. 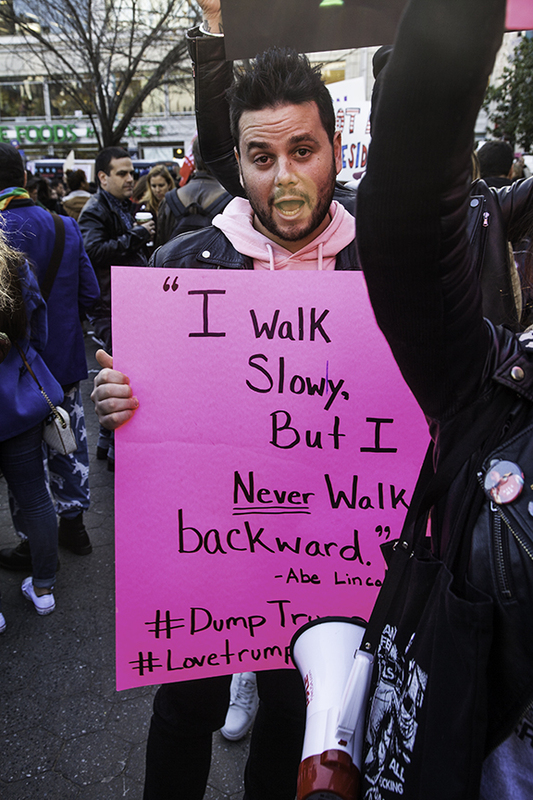 The implication of this sign, of course, is that Trump is walking America backwards. So he is. He is taking America and the world “backwards on its commitment to fight corruption [which] would be fatal to the global anti-corruption effort.” So writes the co-founder of Transparency International. This sign quotes from the 25th Amendment, which offers a way for the Vice-President and the Cabinet to initiate a process to remove a President from office. Articles proposing this possibility have appeared in such serious publications as Foreign Policy and The Washington Post. The Speakers’ Corner, pictured directly above, offered demonstrators an opportunity to address the gathering crowd and voice their opinions. The man standing by the bicycle supplied the microphone and amplifier. There is no question that Russian intelligence agencies hacked American political entities, in particular the Democratic Party, in an effort to help Donald Trump’s candidacy. By Inauguration Day (January 20, 2017), a joint task force was examining Russia’s espionage activities; that investigative force included the C.I.A., the N.S.A., the F.B.I., and the Treasury Department. A dossier compiled by the British intelligence agent, Christopher Steele, “alleges serious misconduct and conspiracy between the Trump campaign and Russia’s government,” but its findings have not yet been corroborated. The danger is that Trump may simply not understand that what Putin is doing is waging war. Such understanding, one suspects, may be beyond the ken of puppets. 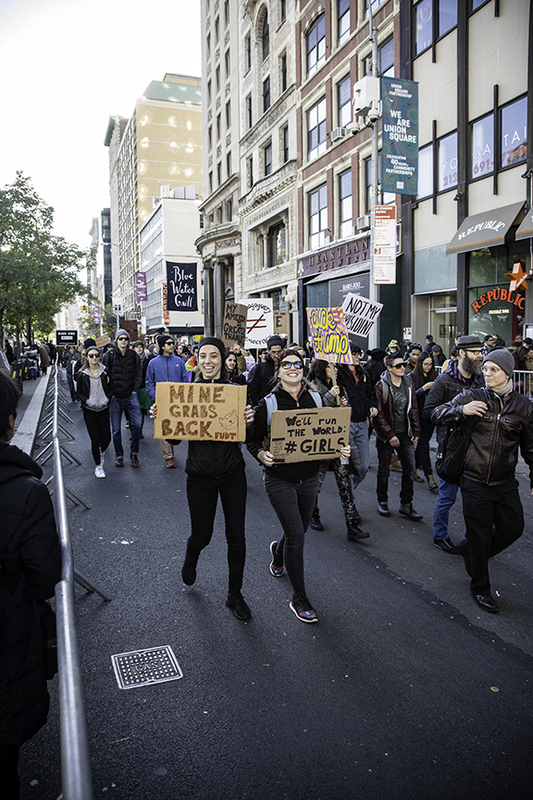 Well before the election, Donald Trump “awakened a feminist revolution in America.” So wrote world affairs columnist, Frida Ghitis. 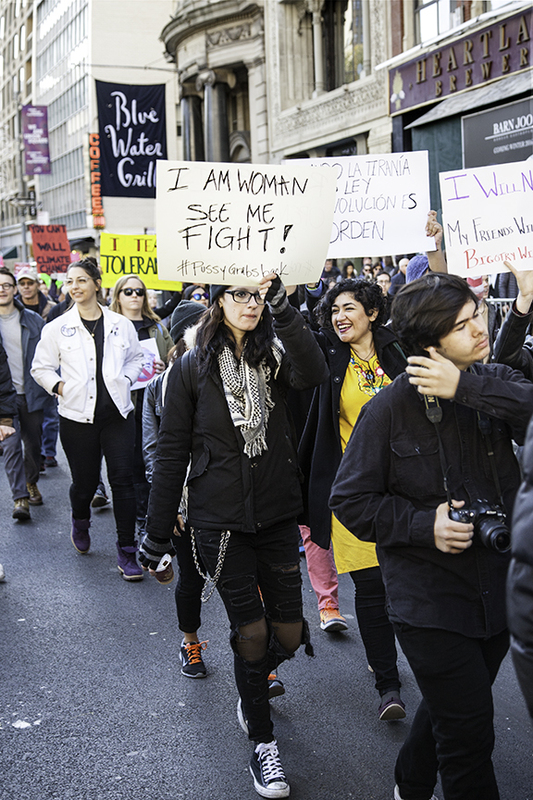 Certainly, the Women’s March that took place on the day after the Inauguration brought crowds three times the size of the inaugural crowd in Washington D.C. Women (and men) demonstrated around the world. There was even a protest in Antarctica. 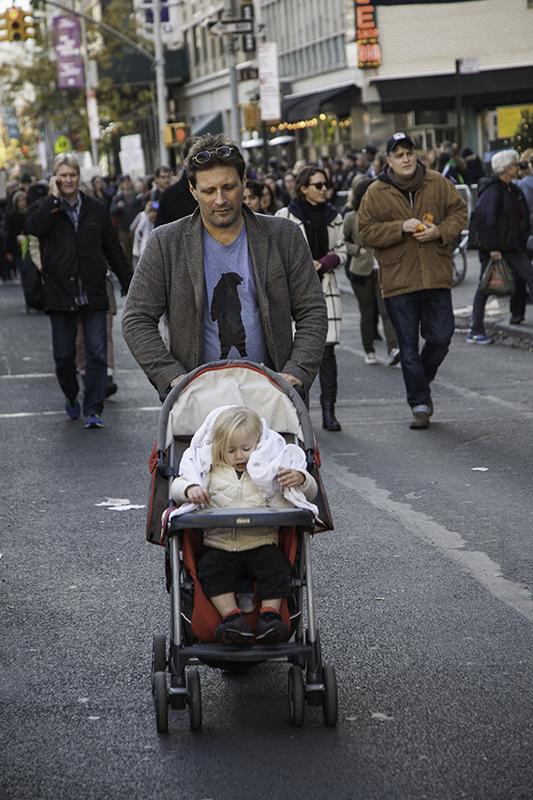 See following photographs for more women on the march. Hmmm. We seem to have a misspelling here. If anyone is unfamiliar with the reference of the cardboard poster on the left, the explanation will be given in a following section, further down. Spartacist/SYC is a carryover from the Fourth International, which has operated in the United States in various forms over the past eighty years. Given its deep roots in Marxism and the Communist League, it champions a more egalitarian society through the promised creation of a workers’ government. CLIMATE CHANGE is NOT a Chinese hoax. I can’t believe I even have to say that. It is an irresponsible farce to allow or to give credence to the repudiation of decades of research and thousands of scientists by a simple businessman. An article in Business Insider reminds us, “the USA is the second largest emitter of carbon dioxide, so if Trump makes decisions to make the situation even worse, we could all suffer.” That was written in November, the day before this rally. Donald Trump’s ridiculous promise to build a wall between the United States and Mexico would be as ineffective as the Maginot Line. 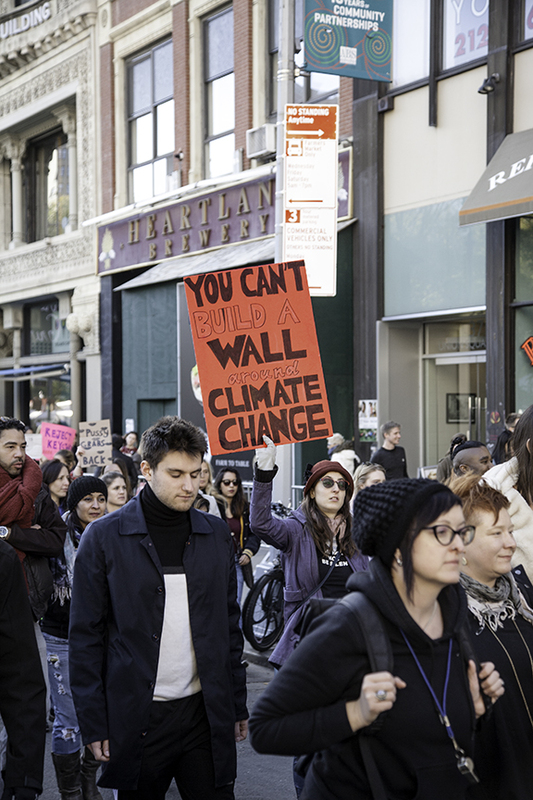 And then, this poster exposes its absurdity by connecting it to climate change–a much more pressing concern than cross-border emigration between Mexico and the United States. Yet, there is an ironic connection between climate change and building a wall, because Donald Trump had wanted to build a sea wall in Scotland to protect his new golf course from rising seas. Such irony. Deep-down, Trump is aware of the dangers of climate change. Only his nature is so perverse that he only can think of himself, even as he creates policies that threaten to destroy the entire world. And so, to the detriment of all, Donald Trump is the scorpion in the old folktale of the Scorpion and the Turtle. Whether climate change or nuclear holocaust, human life on planet earth is being threatened like never before, and the American Presidency enjoys an outsized role in controlling these threats. Yet, even someone with the best of business experience is ill-equipped to assume the presidency of a major world power. Donald Trump’s business record suggests that he is particularly ill-equipped to be president. He has suffered many business failures and has even been called a “bad, bad businessman” recently in a major publication. Very quickly, Donald Trump began to profit from the presidency, and after several months in office, he is clearly not following up on his promises to separate his personal business from the business of the State, to which he was elected. As former UN Secretary-General Ban Ki-moon has said, “we have only one planet. There is no Plan B because there is no planet B.” Given this reality, Donald Trump’s unscientific position on climate change is disastrous and poses dangers to life on earth. On April 22, 2017–Earth Day–citizens from around the world will be taking part in demonstrations being billed as a Science March. Select a nearby venue here. 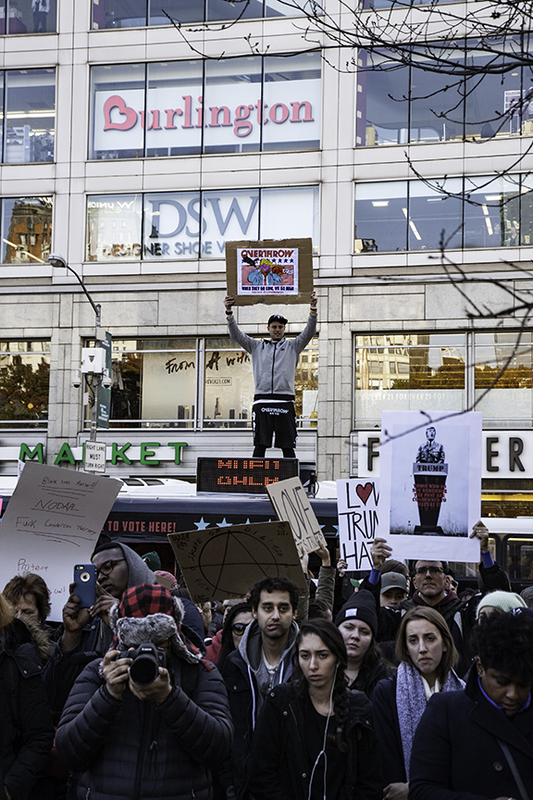 The center poster in the background reads: LGBTQ, Black, Latino, Muslim, Women….We Are What Makes America Great. 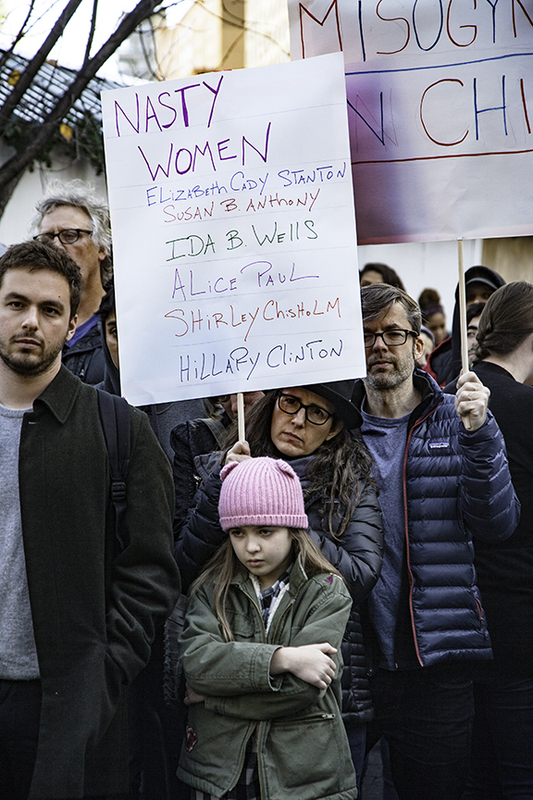 Public demonstrations like this one are precisely “what democracy looks like,” as this woman’s small sign states. However, some of the elements of democracy–such as equal political, legal and voting rights–are being threatened in today’s America. This fringed, red poster reads, One Day We Will Finally Be Equal. For an examination of inequality in America, the best and most comprehensive single source to begin with is this one from the Stanford Center on Poverty and Inequality. Treat all men alike. Give them the same laws. Give them all an even chance to live and grow…. I only ask of the Government to be treated as all other men are treated. 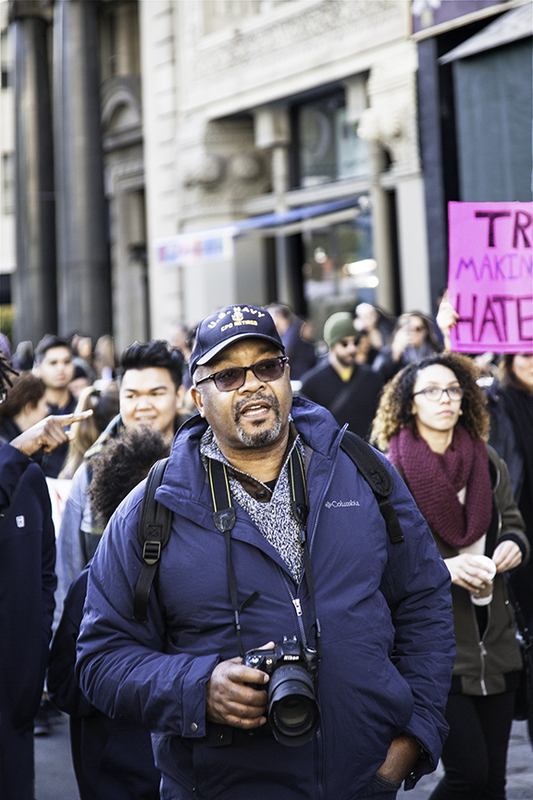 A Huffington Post article states that “In the weeks following his victory, President-elect Donald Trump has not backed away from the racism upon which he built both his campaign and his real estate business.” It then enumerates sixteen examples of Trump’s racist actions. 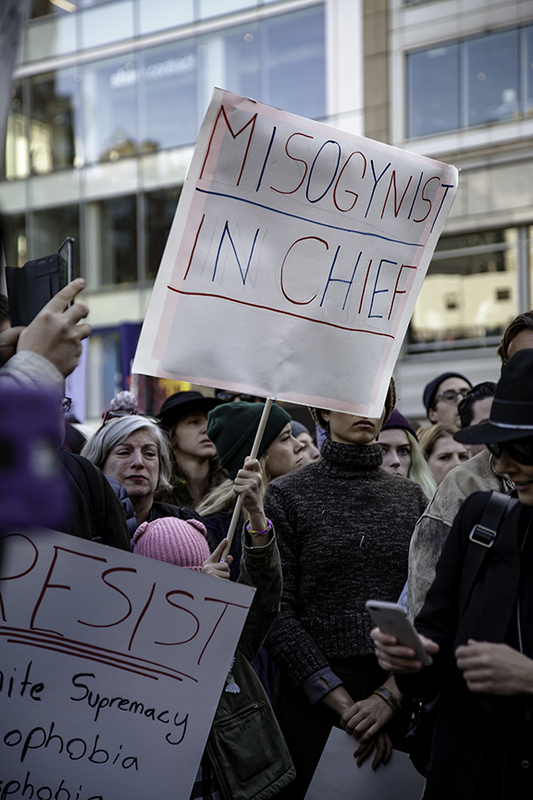 Articles by Claire Cohen and by Alanna Vagianos gather the many offensive, sexist comments that Donald Trump has made, while an article by David R. Morse focuses on the many anti-gay members of Trump’s cabinet. These links will suffice for the many which have covered the same topics. Even though this man’s poster calls for “unity, love and respect,” I think that respect should be the main focus. These are harsh, inappropriate words coming from anyone. When voiced by the president of the United States, these words strike fear into Muslim-Americans. Stigmatized by the most important man in their country, Muslim citizens compromise their identity and feel forced to act or be someone whom they are not. In other words, for their own safety, Muslim-Americans must now live a lie. This is a phenomenon that generations of African-Americans have also had to deal with, and which W. E. B. Du Bois referred to as “double consciousness” in 1903. 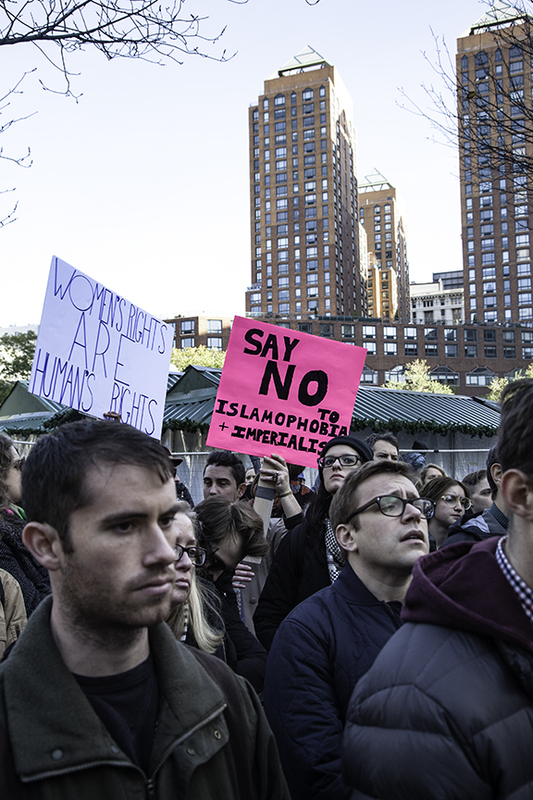 Donald Trump’s embrace of Islamophobia may well be taking America back again–but back to a lesser, not greater, place. Between his border wall, his travel ban and an increased ICE border force, Donald Trump ignores and rejects the reality of immigration. The New American Economy (consisting of over 500 mayors and business leaders) reveals the enormous benefits of immigrants to the American economy. In 2014, immigrants paid $329 billion in taxes; undocumented immigrants pay over $20 billion in taxes and support programs they can’t even enjoy, like Medicare and Social Security. 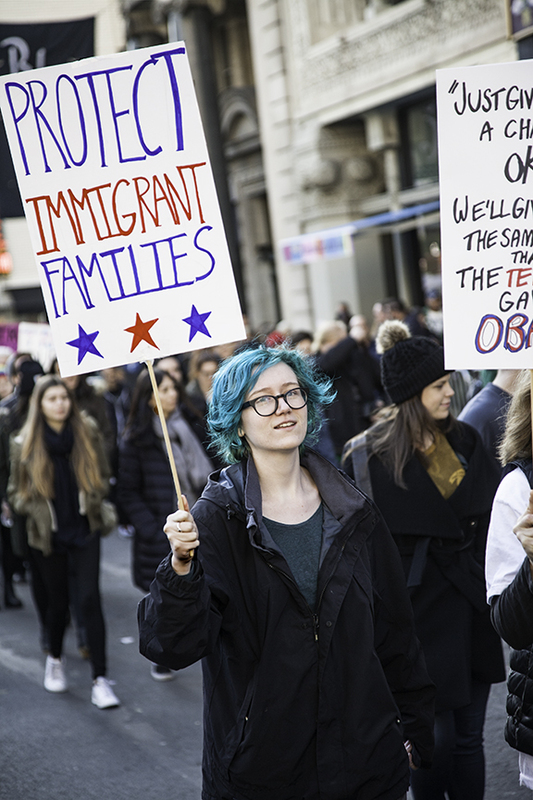 To examine the impact of immigration in your state, district, or city, open this link. Oppression is a basic component of Donald Trump’s interaction with people. Some accuse him of running a campaign of oppression, others of using the language of oppression. 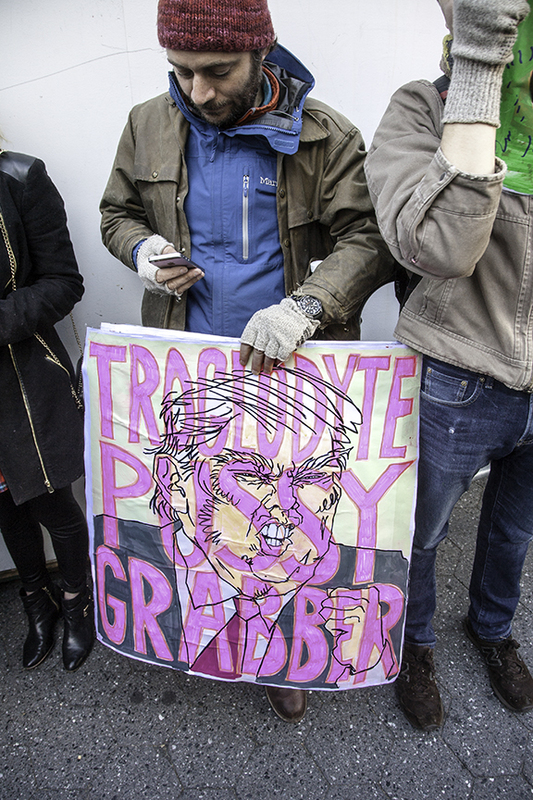 One group has even developed an “anti-oppression diet” to counter Trump’s devaluation of so many marginalized groups and to help each of us to cleanse ourselves of the distorted paradigms that he and his daily statements have inculcated in us. These posters, and the one immediately below, were painted for this event by the New York artist, Hope Gangloff. In the poster I have titled Trump as Jabba, we see the orange, slug-like creature, Jabba the Hutt reclining on the White House lawn. In front of him, secured by chains, is Melania Trump. To the far right is a young White House intern, being groped by the slug-like Trump. Melania, of course, substitutes for Princess Leia, and Gangloff’s painting is a fairly direct adaptation from the 1983 movie, Return of the Jedi (Star Wars–Episode VI–Return of the Jedi). And then, just two days ago, Trump publicly supported Bill O’Reilly, who has been accused of sexual harassment by several women: “I don’t think Bill did anything wrong,” our President stated. Tragically, innate nature changes slowly–if ever. 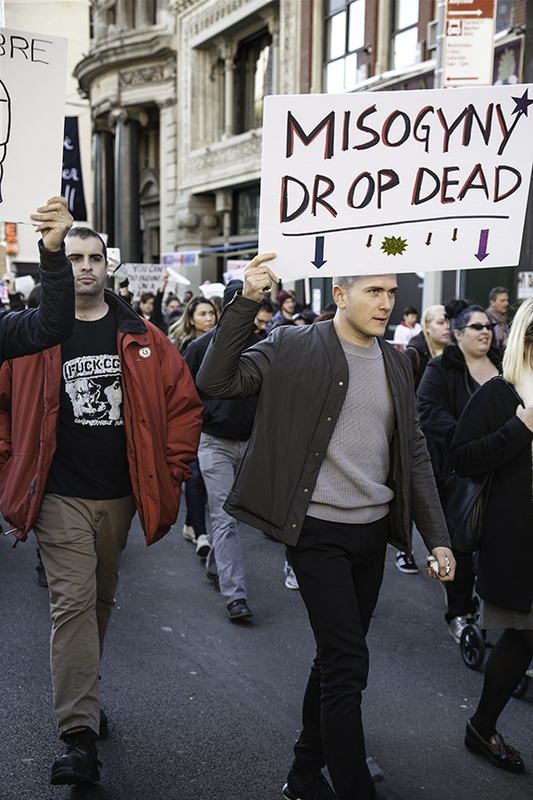 Within hours, “nasty women” took on positive connotations around the nation, and led to nasty woman t-shirts as well as a Nasty Women art exhibition in Queens. Hate was the fuel for Donald Trump’s campaign, and it continued to dominate after his election. Over 1,000 acts of hate had been reported around the country in the first month since his election. and for its social fabric, as was put forward last month in a U.S. News & World Report article. Few would deny that Donald Trump is a bully. He was a bully as a school kid. He was a bully as a businessman. How sad it is that this US President, the most powerful person on earth, is setting such an example of his own weakness and insecurity. To have an idea of some Trump lies, open this link to Mary Ann Georgantopoulos’ stunning compilation of eighteen significant lies, all from this year. Even though Trump may well lie out of habit, he also does so with a political intention to mislead the public, to test his subordinates’ loyalty, and to reveal his power (over mainstream media and political opponents). So argues the philosopher, economist and writer, Tyler Cowen in a revealing Bloomberg View article of this January. But, there is even a more devious intention to Trump’s lying. In a Newsweek article from last month entitled, “How Trump Lies About His Many Lies,” Robert Reich gives a wonderful analysis of how those “lies,” when repeated, eventually become “disputed facts,” then “controversies,” and then a means to sow total confusion in the public. Trump’s lies are not merely dishonest. Trump’s lies are insidious. However, this may be the most extended and public rejection ever. It is still happening. These photographs, of course, date from November 12, 2016. 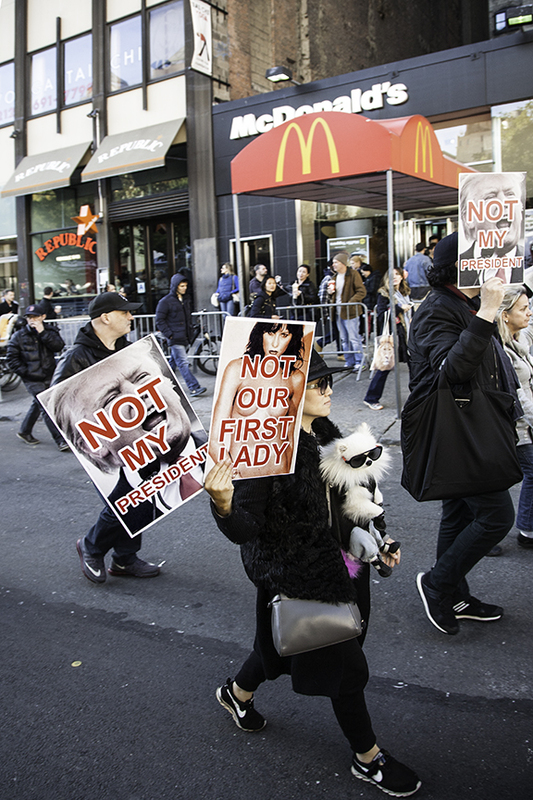 On February 20, 2017–President’s Day–thousands of people, coast-to-coast, marched in Not My President’s Day rallies. 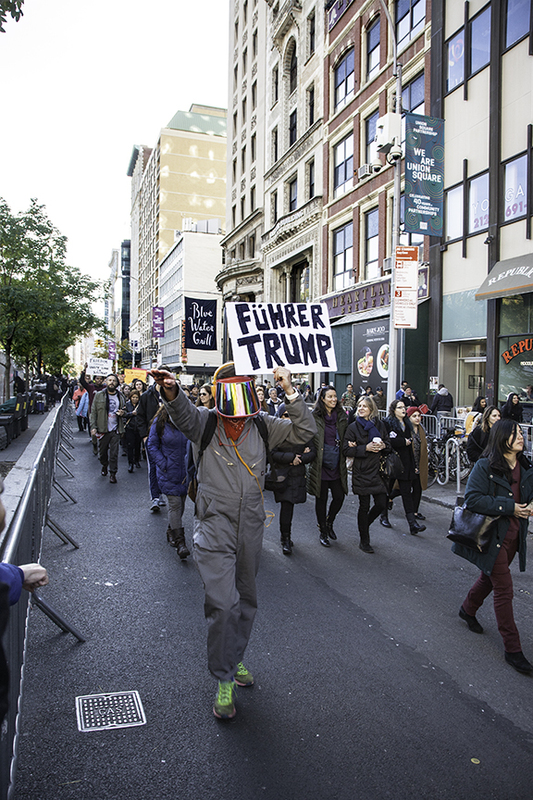 Artists, musicians, performers staged special events, and there were even anti-Trump performances that day in Europe. What makes the antipathy to Donald Trump so different is that it is not so much about politics and competing political positions. It is about upbringing. It is about values…“a repudiation of his values,” as the blogger Dan Arel wrote. I live in the America that won — the America with art and empathy and a free press and fierce protest. Not my president, not now, not ever. In referring to “art,” “empathy,” a “free press,” Lindy West also focuses on values. I am reminded of “10 Letters to Live By,” a list of values courtesy of Stanford neurosurgeon James R. Doty: Compassion; Dignity; Equanimity; Forgiveness; Gratitude; Humility; Integrity; Justice; Kindness; Love. Most of us were brought up to honor these values, and until the election of Donald Trump, so were all the men who had been elected president of the United States of America. Donald Trump’s values are the antithesis of these, and if this is not reason enough to say not my president, the third photograph above should suffice. 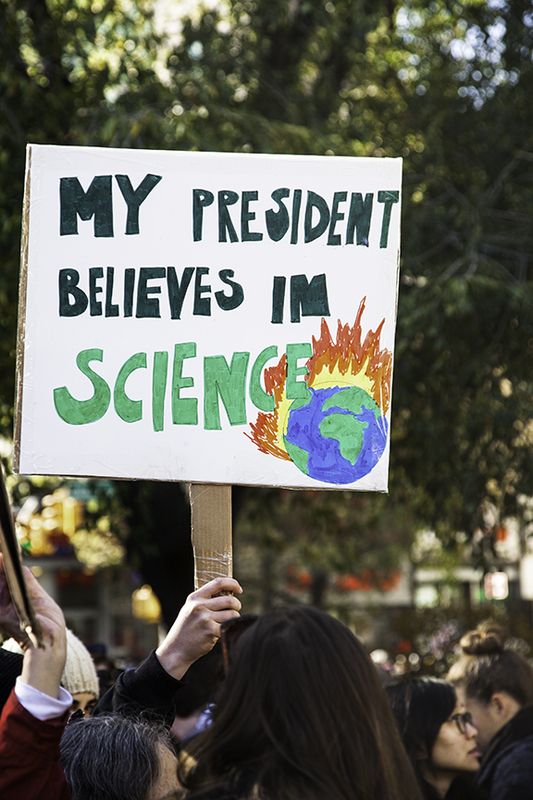 Our president MUST believe in SCIENCE. Donald Trump doesn’t, and so he is endangering the entire world. The Electoral College was created as a compromise mechanism to create an indirect mode of election for President and Vice President. It may have made sense two centuries ago, among the original thirteen states. Today, however, the fact that it “violates the principle of ‘one person, one vote,'” and more than doubles the electing power of the residents of some states over that of other states undermines the idea of a democratic America. And so, for the fourth time in two-hundred years, a Democratic presidential candidate lost the election due to the Electoral College system while having won the popular vote. 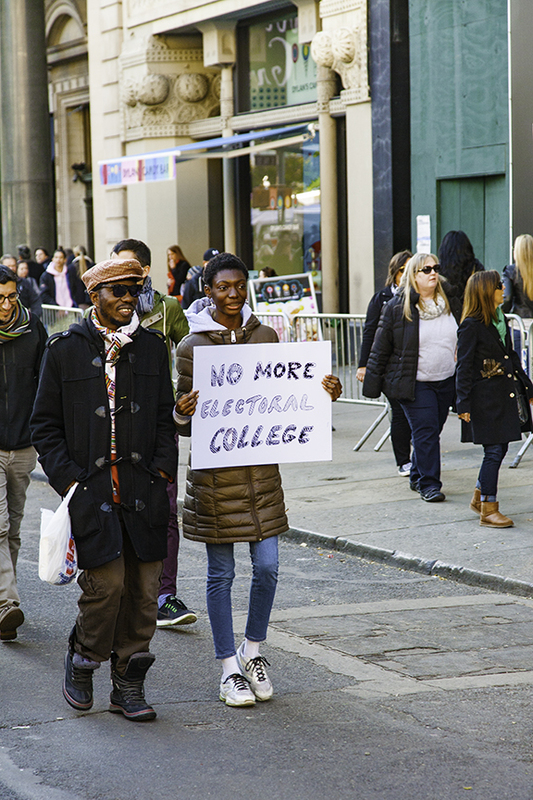 I suspect that the sign in the top photograph which reads, Voting Is Not Enough, alludes to the types of problems indicated in the following two photographs: the accurate counting of votes and the suppression of certain groups of voters in several states. However, the irony is that those words, “Voting Is Not Enough,” is the name of a program of the conservative Leadership Institute to train activists for the purpose of getting out Republican votes in battleground states. The first part of that same poster (in the middle photograph) refers to Election Fraud. 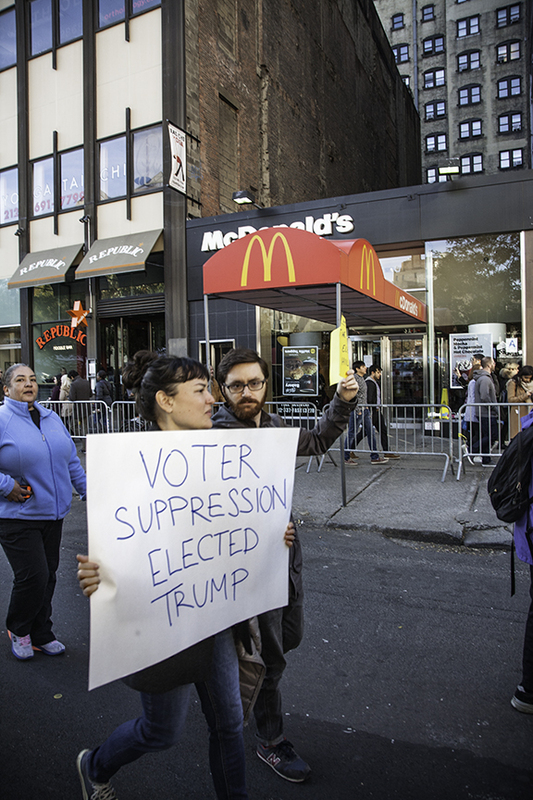 The only election fraud in America is that perpetrated by Donald Trump, who is perpetuating his lie that 3-5 million people voted illegally for Hillary Clinton and that “thousands” of people were bussed into New Hampshire from Massachusetts to vote “illegally.” Ari Berman worries that, playing off these falsehoods, the Trump administration is likely to massively intensify GOP voter-suppression efforts, especially with Jeff Sessions leading the Justice Department. First come the unverified tales of fraud; then come the urgent calls to tighten voter registration rules and increase “ballot security,” which translate into laws that disenfranchise tens or hundreds of thousands of qualified voters. 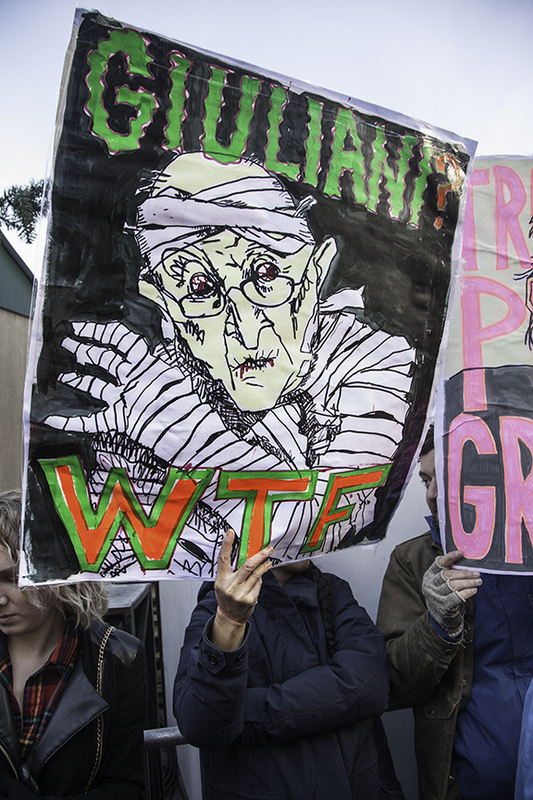 Let’s leave fear to its master manipulator, Donald Trump. 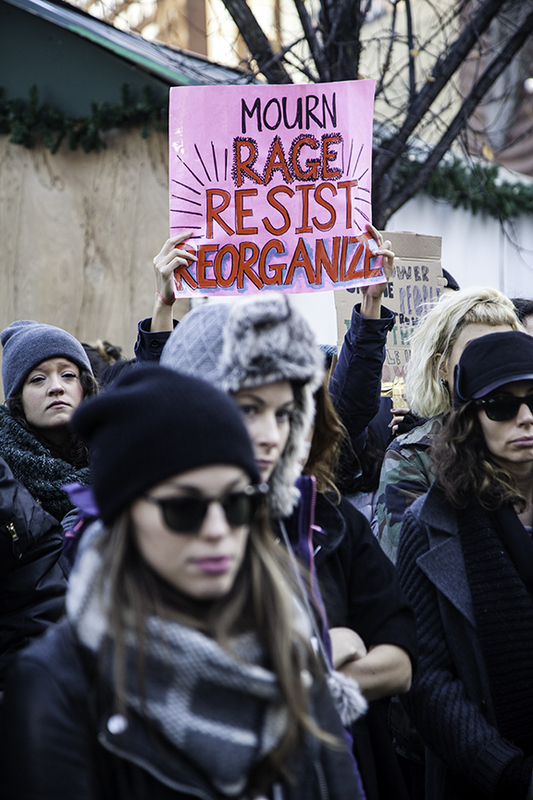 To be truly revolutionary, Americans need to embrace what has been called “big organizing,” as defined by Becky Bond and Zack Exley in Rules for Revolutionaries: How Big Organizing Can Change Everything. 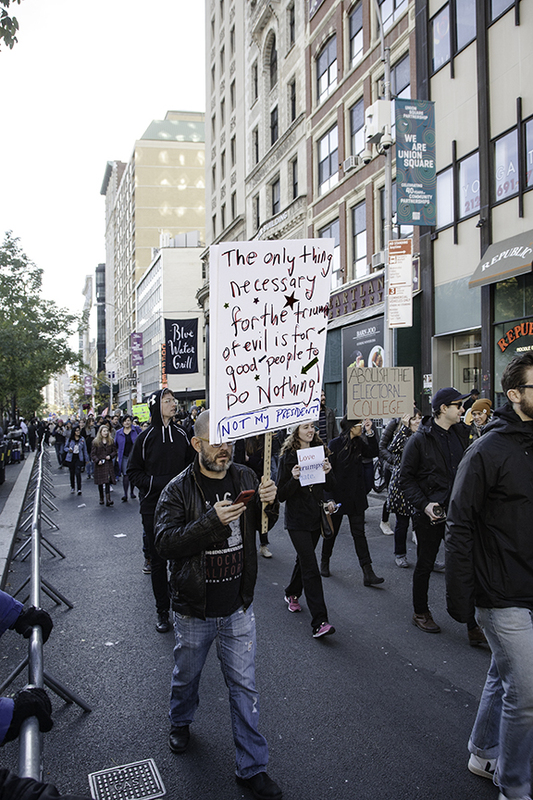 “We shouldn’t be surprised if an Occupy Wall Street-style, mass-organized movement arises in response to Trump’s presidency,” they state. 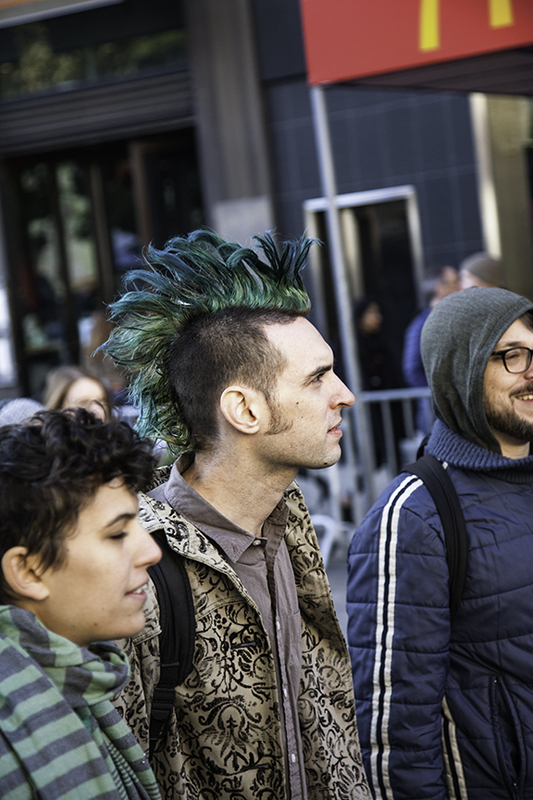 It is suggested that Rules for Revolutionaries might become our generation’s political manifesto. Meanwhile, consult this compilation & guide to the many Anti-Trump resistance movements to find one that most appeals to you. 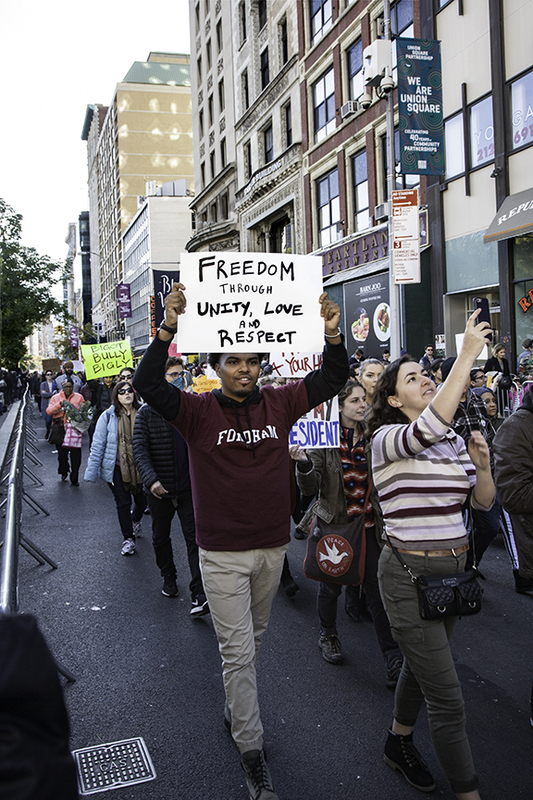 As these demonstrations show–and there have been many since this one and the previous one that I have documented—America is, indeed, becoming revolutionary again. 61% say that he does not share their values. I would agree that Donald Trump is not the face of my America. Much appreciate this artistic and historic documentation of these deeply distressing times. You have done so much research with helpful links to back up all statements. I’m thinking may the Pres have a major stroke while eating his favorite 2 foods…..Big Macs and M&Ms. I kid you not.